SchoolDude is the Online Work Order Request System used by WHRHS. Please use this service to submit a request that suits your needs. 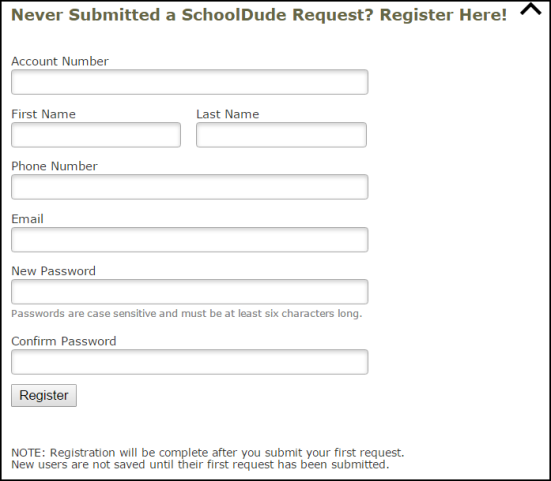 Below is a direct link to self-register with SchoolDude. Please ensure that you register using your official WHRHS email account. If you are submitting your first request, you will need to complete the registration form. Use the instructions under New User to create your account. If you have submitted requests through the MySchoolBuilding page in the past, use the instructions under Returning User to log into your account. The IT Department has provided you with a specific link that you can use to access the MySchoolBuilding portal located in the whrhs.org bookmarks folder on your Google Chrome bookmark bar. If you are having trouble logging in, see Requester Login Help for troubleshooting tips. Go to www.myschoolbuilding.com. You can bookmark this page or create a shortcut on your desktop to make it easy to come back to this page later. Enter your Email Address and Password. Click Sign In. If you are submitting your first request, you must enter registration information first. Click on the down arrow ( ) next to Never Submitted a Request? Register Here! to expand the registration form. *Note: Your registration will be complete after you submit your first request. Enter the WHRHS Account Number 408096817 if it does not automatically populate in this field. Enter your First Name and Last Name, as well as your WHRHS Phone Number Extension and Email Address. Type the Password you would like to use to log into your SchoolDude account and confirm it. The password you choose must be at least 6 characters long. Click Register to go to the work order request form. Make sure you are on the Maint Request tab at the top of the screen. *Note: Any field marked with a red checkmark ( ) is a required field. Step 1: These fields will already be filled in with your contact information according to how it was entered upon registration. Step 2: Click on the drop down arrow and highlight the Location where the work needs to be done. Do the same for Building (if available) and Area. Also, be sure to type in the area description or room number in the Area/Room Number field. Step 3: Select the Problem Type that best describes the request/issue you are reporting. Step 4: Type in a Description of the problem. *Note: Remember to fill out any required fields marked with a red checkmark before submitting your request. Step 5: Enter a Time Available for Maintenance when it is convenient for the work to be performed. Step 6: Attach a file to your request if necessary (i.e. a picture of damage or setup diagram). Step 8: Click the Submit button. You can view any requests that you have entered into the system by clicking on the My Requests tab. Hover your mouse over the Shortcuts link and click on My Maint Requests. On the My Requests page you will see up-to-date information on any requests you have entered into the system; including the current Status, work order ID number, and Action Taken notes. You can click on the number next to the Status description in the Request Totals section to see all of your requests marked with that status. You can also search for any work order request by typing a key work into the Search box and clicking Go. You can print out a listing of your requests by clicking on the printer icon.